Polhamus is self-taught as an artist. Her undiluted watercolor and ink drawings are characterized by intense, densely fragmented compositions. 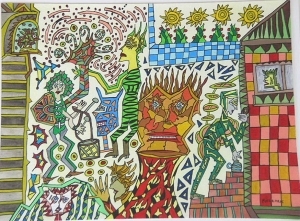 “She has described the process of creating these works as entirely spontaneous and intuitive.”2 They have a dreamlike narrative quality in which convoluted environments are typically inhabited by cartoonish clothed figures as they carry out various activities that are alternately mundane, mysterious, or sinister, through a labyrinth of interconnected spaces. “Her drawings often include peculiar vehicles, weaponry, musical instruments, stylized vegetation and jaggedly geometric patterns that contribute to a pervasive sense of anxiety.”3 They are mysteriously compelling and consistently original in style. 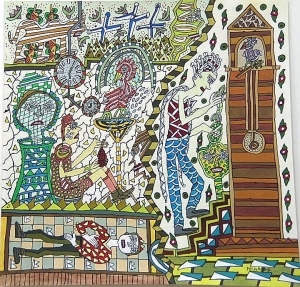 From a distance, the palette and patterns of her work may resemble certain Mexican Folk drawings. I first met Melissa Polhamus in 1995. Her work had been brought to my attention by Mike Smith. 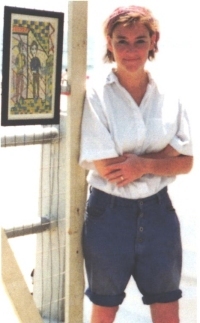 I organized an exhibition of her drawings at my gallery, Urban Artware in Winston-Salem, NC in 1998. 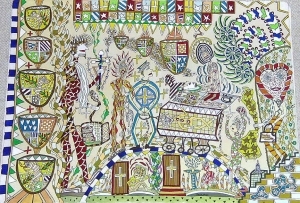 Polhamus’ art has since been exhibited at The Abby Aldrich Rockefeller Folk Art Center, Williamsburg, VA; American Visionary Art Museum, Baltimore, MD; Arkansas Art Center, Little Rock, AR; Danville Museum of Fine Art, Danville, VA; Delaware Center for the Contemporary Arts, Wilmington, DE; Luise Ross Gallery, NY; INSITA triennial, Slovak National Gallery, Bratislava, Slovakia. 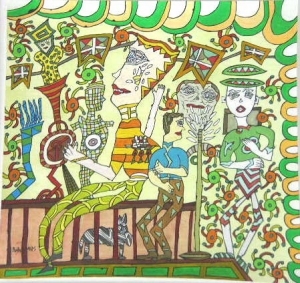 Her work is in the collections of the Longwood Center for the Visual Arts, Farmville, VA, and the Ellin and Baron Gordon Art Galleries, Old Dominion University, Norfolk, VA.
1 Tom Patterson, “Art Along the Boundaries,” Raw Vision, XLVI, Spring 2004, p. 33. 2 Tom Patterson, “A Flood of Images,” Winston-Salem Journal, October 11, 1998, sec. E, p. 4. 3 Patterson, “Art Along the Boundaries,” p. 33.